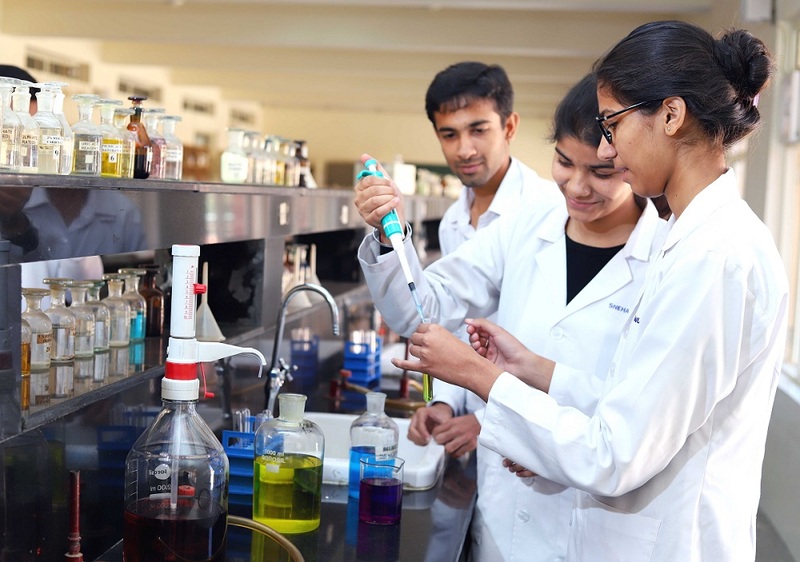 Swami Rama Himalayan University, a unique treasure trove of biodiversity and conserved gene pools, believes in knowledge dissemination through teaching, learning, and research by innovation, invention and discovery. SRHU with its State-of-the-Art laboratories, excellent hospital, access to LMS (Learning Management System) and frontline expertise provides a remarkable opportunity to the researcher to address fundamental questions and applications to solve problems in human welfare. Situated strategically, it also serves as a catchment area drawing students from rural Himalayan interior to diverse metros and contributes significantly to multi-dimensional capacity building. SRHU is a research oriented university comprising a unique platform for interdisciplinary research bringing Science to Medicine, Bench to Bedside, Technology to Production, and Management to Business. With its cross-disciplinary strengths, access to frontline instrumentation and enormous data bases at the fully fledged hospital, it has the potential to test and clinically validate ideas/products being generated globally. All schools and Institutes are actively engaged in research with several departments publishing in high impact factor journals. The frontline laboratories are NABL accredited. Our University is Scientific and Industrial Research Organization (SIROs) recognized by Department of Scientific and Industrial Research (DSIR), Ministry of Science and Technology, Government of India. University has also established an IPR cell sanctioned by UCOST to facilitate all the researchers to come on a common platform for availing the facility with an aim to foster an environment in which creativity and innovation can flourish. Clinical investigations focus on elucidating basis of disease, translational research and applications that lead to improvised treatment and patient care. Basically the researches are Disease-derived, Patient-derived. Besides, HR, Marketing, & Finance, and Civil/ Mechanical/ Electrical/ Electronic & IT Engineering focus on business and industry. Research in SRHU begins early at UG level, being an integral part of the pedagogy. UG and PG students are initiated through projects built into the framework of a course, subsequently taking up separate individual projects with in-house and external Industry mentors. Researches on Anvil: Researches are in progress at SRHU in several areas under Medicine & Bio-Sciences, Engineering & Technology, Management Studies, etc. To discover predictive and prognostic molecular markers for predicting treatment response and prognosis in medicine and cancer medicine and outline what future may hold. To assess, analyse and document the genetic diversity of nutraceuticals/ medicinal plants/ endangered species of the state of Uttarakhand by Molecular markers. Develop the bioprocesses for bioremediation of water and wastewater streams by microbial consortia using indigenously designed bioreactors. To understand and study applications of Production Engineering (Metal forming), Non-conventional energy resources, Cyber Security, Cloud Computing, Renewable Energy Resources, Biomedical Instrumentation, Atmospheric & Radiation Physics, Water conservation (recycling) and wastewater pollution control, Hydrodynamics, etc. The department is engaged through research to study dynamics of Satisfaction, effect of Work Values, issues of Non-Performing Assets, Knowledge Management & Organisational Learning, Psychological Contracts, etc. Research Support: A distinguishing feature is the in-house financial assistance the university provides to encourage faculty to conduct research through projects administered by a robust Intramural Committee. The grants support translational research projects of faculty and students. The departments also attract considerable funding as Extramural research projects from various agencies viz, ICMR, UCOST, CSIR etc. Capacity building in Research: The departments constantly conduct seminars, symposia, hands-on workshops and training programs in various research areas including Research Methodology imparting Statistical and Computer based skills. A recent venture is the introduction of Bio-IT tools and their applications in Healthcare culminating into a Indo-UK joint Symposium on ‘Precision Medicine: Genes, Environment & the Data Challenge’, 10 March 2018. Almost all departments offer PhD programs in specialised areas. As a step towards research capacity building, a high profile inter disciplinary program dedicated to Clinical Investigations has been launched viz., Master of Science in Clinical Research. Equipped with cross-disciplinary skills of Data Science. These bio-medical graduates will foster translation of information technologies between clinical and research areas. They are already successfully contributing to database on Pain burden in Cancer Patients, Neuro developmental and clinical milestones vis-à-vis iodine deficiency, Thyroid hormonal profiling and pregnancy outcome. Biosciences - Environmental Biotechnology and Nanotoxicology. Community Medicine - Nutrition, Maternal & Child Health, Immunodiagnostics, Molecular Epidemiology, Epidemiology, Transport Risk Management, Environmental Biotechnology, Environmental Iodine Deficiency disorders and Nanotoxicology. The department also conducts Non Communicable Disease surveillance and has the distinction to have been identified as the Community Health Centre for National Health Programs providing supervision, training and research. Cancer Research Institute (CRI) - CRI has the distinction of maintaining a massive registry of cancer. The chief areas of research are Head and Neck cancer, Bioresonance Therapy, IMRT, Gastrointestinal tuberculosis, Oesophageal carcinoma, Palliative care. A distinguishing feature of research at CRI is integration of Alternate Medicine (Ayurveda / Yoga / Holistic Medicine / Homeopathy etc.) in patient care. Bio Sciences - Environmental Biotechnology, Nanotoxicology, Fermentation Technology, Bioremediation and Biodegradation etc. Engineering & Technology - Cyber Security, Non-conventional energy resources, Water conservation (recycling) and wastewater pollution control, etc. Rural Development Institute (RDI) - is a full-fledged training, documentation and media centre with research capabilities and acts as nodal agency in the areas of health and water in the State having been empaneled National Key Resource Centre by Ministry of Drinking Water and Sanitaion, Govt of India. With its enormous outreach (2000 villages so far) the research focus is on mother and child health, mental health, drivers & community. SRHU provides excellent research facilities to the faculty and students. The entire campus is on internet with a well stocked central library. All departments are equipped with computers and frontline instrumentation, CRI being renowned for its cutting edge equipment and processes. A specialized research facility viz., Referral Centre for Diagnostics and Research has been created recently with about 30 sophisticated state-of-the-art instruments with supporting facilities. Catering to the interdisciplinary applications in research it facilitates scientific interactions among different departments.